Meet Saad. At just 9 years old, he’s already facing one of the most difficult tests any grown man or woman would fear to experience. 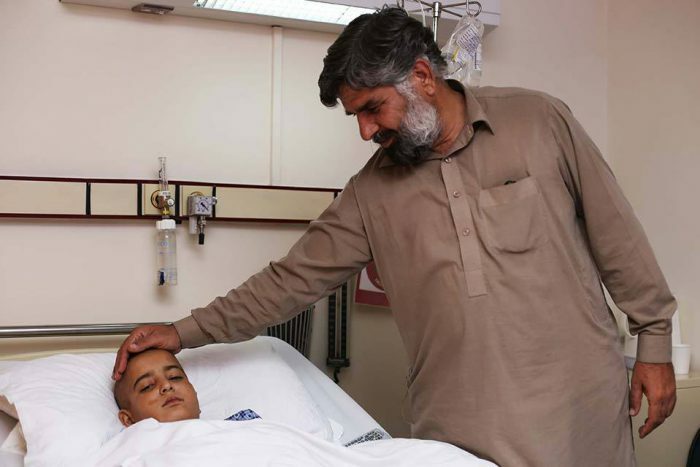 Saad’s father, Aamir Nawaz, brought Saad to Shaukat Khanum Hospital after a long and painful struggle to find proper medical care. Early detection of cancer and a proper diagnosis play a massive role in saving the lives of young cancer patients. Amir Nawaz is just one father out of too many in Pakistan who are angry to have lost precious time in getting the correct diagnosis for his child, and starting the correct treatment. In the end, he and his son travelled to Lahore from their hometown, out of desperation and as a final resort. To their surprise, Saad was diagnosed and admitted for treatment within 9 days his biopsy at Shaukat Khanum Hospital. Their prayers had been answered. Now Saad is in safe hands. Saad and his father have been in Lahore for several months now as Saad continues to undergo treatment. “He misses his brothers and sisters back in Mianwali,” explains Amir Nawaz sadly, because it was impossible for him to have brought his whole family to Lahore. Their situation isn’t uncommon. About 75% of the patients receiving treatment at Shaukat Khanum Hospital, come from extremely poor backgrounds, and often families are torn apart, with one parent staying with the child and the other staying at home to take care of the rest of the family. Separation from the family during cancer treatment can often have a devastating effect on a child patient’s psyche and will to fight the disease. Yet in spite of all this, Saad remains strong. ‘Supportive’ and ‘cooperative.’ These are the odd choice of words Amir Nawaz uses when speaking of how his son is holding out. It is surprising, because at a time when he is most in need of support, this 9 year-old is concerned with keeping a brave face for his family, and doing everything he is able, to ease their worries for him. Over two decades of service at Shaukat Khanum Hospital, we’ve witnessed the miraculous strength of the human spirit in all its many forms. To us, the strength and struggle of every patient is affirmation that our work cannot be more necessary. The strength and struggle of small heroes like Saad deserve support. Your donations are a lifeline for children like him at their time of greatest need. Find Out how you can gift your zakat and sadaqah to give hope of life to a patient in need at Shaukat Khanum Hospital.